My diet is a disaster. I love sugar. I love processed things. I love fat, the good yummy trans/saturated kind. It is pretty gross. My poor diet, along with lack of exercise while I’ve been off running, have led to some super tight fitting pants and continued exacerbation of my crazy tummy. Intellectually, I am aware of the damage I do to my body when I consume a soda or when I drink my beloved milk or eat ice cream. But I have yet to remove the emotional element from my eating and focus on nutrition. 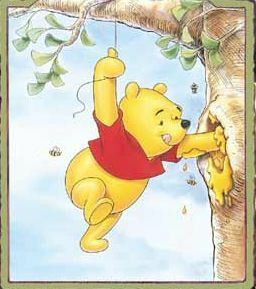 I also have the self control of Winnie the Pooh at the honeybee hive. I noticed on a friend’s facebook page that this week is Compassion Over Killing‘s annual 7-Day Veg Challenge. I have dabbled in vegetarianism and veganism in hopes of improving my diet and health over the years. (In addition to my love of cute, cuddly farm animals and my detest of industrial farming.) So, I signed up and am pledging to try a meat free diet for the next 7 (now 6) days. I don’t really eat a lot of meat products anyway, so this isn’t a large hurdle. However, to make the conscious effort to focus on plants and move away from animals is something that has great value. I look forward to the delicious challenge. I’m going to focus on what goes in and monitor how it effects my body. I’m also going to try this week to eliminate processed foods as much as possible, focusing on whole foods.